Cute app: love the calendar and the x’s Totally inaccurate! I have 10 work days left, it says 11; there are 14 calendar days left, it says 12! Save your money and do your own calendar! It’s 100 work days off! It’s the best app for counting down to that special day. Everyday, my coworker would always tell us how many days she had remaining before she retired, down to the hour, minute, and seconds. I was so impressed that I had to get it and started my countdown for retirement 2 years out. I retired 5/31/18. The app lets you pick a nice picture for the occasion. It’s easy to use. You just enter the date, vacation days, and other significant off days and you to opt display the information as calendar days remaining and work days remaining. I selected both types of days to be displayed. I have had several issues with the app and emailed support twice. I have yet to receive any response. Not worth it. 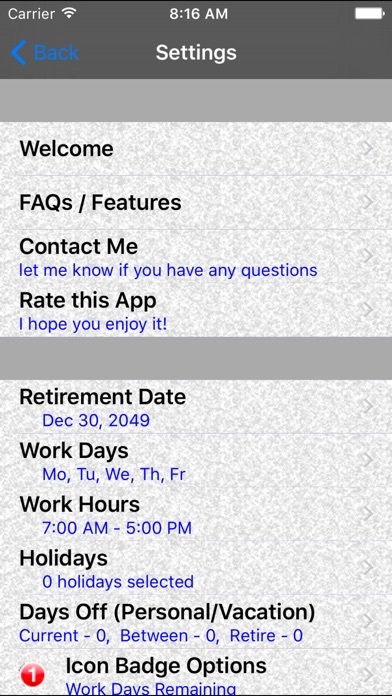 Loved being asked ‘how long before retirement?’ and I’d pull up this app and boom. Today was my last day at work, snd it was wonderful watching the days tick by. Great app! I’m not OCD just wanted to see how long till retirement lol. This works just fine for me. No in app purchases and no adds yeah! I’ve manually counted the days till retirement and I count 92 days. The app says 81 days. I don’t see any way to correct it’s count. So I deleted it from my phone. I really do like this app, but...you knew that was coming. 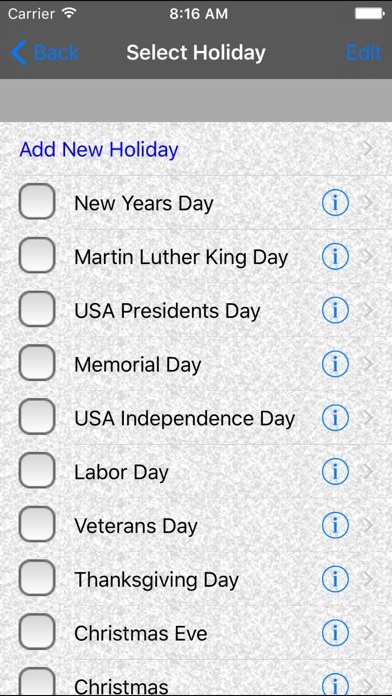 I wish it was updated more often I wish it had current or updated holidays or let me add a day as a holiday instead of just a day off I wish it had an Watch app I hope it’s a 64bit app It’s lots of fun counting down the days. I like the flexibility and sorting out my actual working days vs calendar days. It allows for planning your time really will. I just love this app. 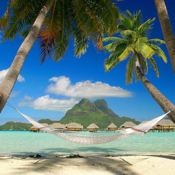 I kept changing my mind of my retirement date and it was so easy to adjust. 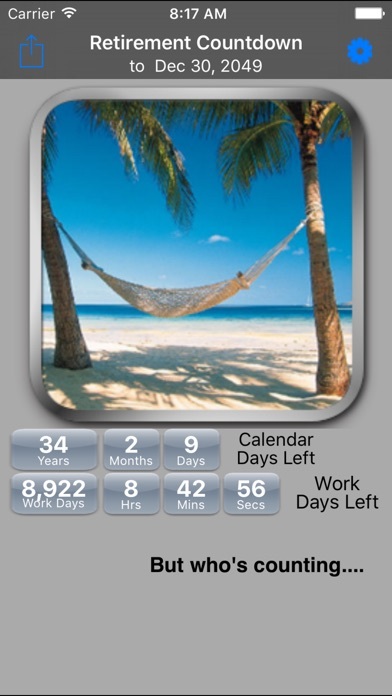 I love counting down to things I my use it for vacations after I retire!! Too bad we haven’t found a way to get the time to go faster. I do enjoy flashing the app in the face of my more annoying co-workers. Love the idea of this app. Unfortunately, the days don’t cross off - I have to reboot my phone to get the days to cross off. Emailed the developer 3 times and still no response! Why. Worst app ever. I would give it zero stars if I could. Fun app to show everyone I work with. App is really steady to use. Glad it has the option of marking of holiday and vacation days so you can get down to the true workdays. The only thing it’s missing is the ability to add a widget. Hopefully that will be in a follow on release. This little app does what it is supposed to: Count down the days left. It is most accurate with calendar days, as opposed to work days, as that requires updating info by the user. To me, that's a great, big, fat "So what?" The date after your last day at work should be the one you're concerned about. Great app to remind myself that my time in Hell on Earth will eventually end. This app is awesome, make my calculations a lot easier to see. Thank you for the outstanding app and service. This app has done the job for me. Need to fix the icon badge notification, which stopped working a while back. Some months have 5 weeks! This app doesn't allow for a 5th week in a month, i.e. cannot put Memorial Day 2017 on as a holiday. I had a look alike app and it did not provide any of the features of this one. Love the abily to count work days and calendar days and add holiday. My own photon in the countdown makes it perfect for me. This app is perfect for me. Thanks!! 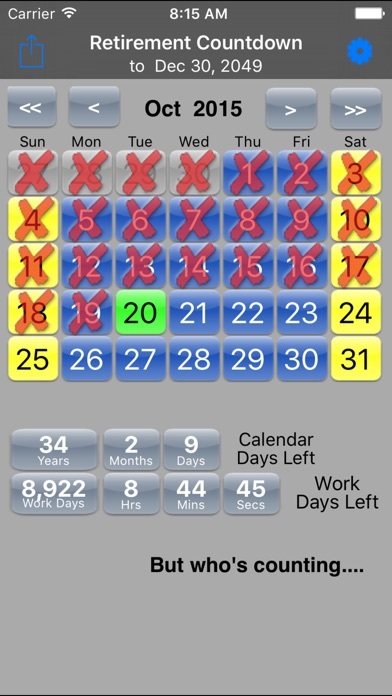 I bought this app because I wanted to have a badge that shows me how many days I have left. the settings are there, but there's no badge and the app isn't even listed in my phone's notification settings. I sent an email to the author, no response yet after several days. So unless something changes soon, I'm going to try to get my money back. Should have tried the free version first! I have it counting down the days. As a firefighter I wish it had more options for work hours. But still very happy! The app is fantastic when working. However, it has stopped working so many times in the past I cannot count them. An error message shows on the home page "not currently working", then sooner or later it starts again. Crazy app! It will reset itself and I have to put in all my days off. Very upset. This is the 3rd time this has happened. This app is encouraging, but has some issues. Biggest for me is that the number of workdays I have remaining is being recorded about 20 off. I've tried to see where the error is, but not having any luck with that. 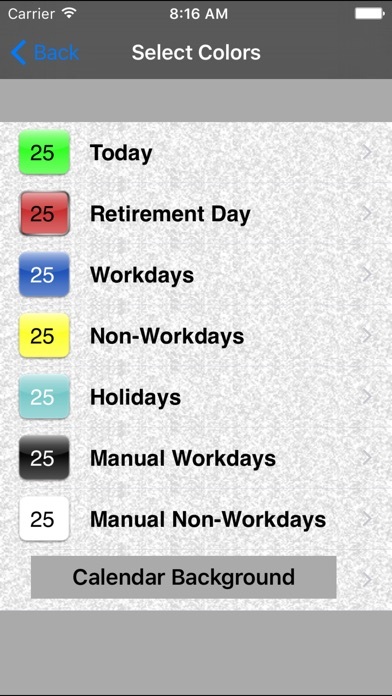 Counting the work days as shown on the calendar pages of the app, they are color coded correctly. But the little red number is about 20 short. Just a little DIScouraging. So, I'm changing to displaying calendar days remaining. This is exactly what I was looking for!! Works perfectly & and is fun to look at and dream as I count down the months & days!!! At first it was working correctly, but now the number of days left is wrong. This would be great if it worked. This is a simple but great app. I've been using it from about six months out. With only three to go it's great to visually see my countdown. I just bought it and it won't open! I have thoroughly looked through the settings and do not see anything I missed but there is no number on the badge. I'd appreciate if you let me know what setting I might b missing. I'm a short-timer-- have about 6 months more before my retirement. It was easy to set up and configure. Color coding of days worked vs days off was easy to set. Now when things get stupid on my job I open the app to see how few days I have left and I can smile again. Hubby has over 9 years until retirement, but it's still fun to count down the days until we can move where it's warm year round! I like the ease of the app, but the work days are not adding up correctly for some reason. Due to the adding of work days incorrectly, is why I didn't give it a 5 star. Perfect! I cab subtract all vacation days etc and see exactly how many work days are left until retirement. What a boost for my morale !!! Nice App I expected a banner but It’s still good. I’m about 1 half years to retirement so it’s great to just look at especially when I’ve had a bad day. It is a cool app that allows one to enter a personal picture in the frame, but it keeps freezing up unlike the free apps available elsewhere. Only $0.99 but it still chaps my hide that I paid for one that isn’t as good as the annoying Ad versions. The ideal motivation when you’ve been working for 40 years. Being a nurse and working 12 hr shifts is a little difficult to get accurate timeline! I work a 56 hour work week with 24 hour days. It would be nice to have options to setup work days the would fit with this type of schedule! I would think that would be an easy fix on the next update! It does track days until my last so I guess it’s good for that!! This app got me through the last five months of working. My co-worker retired the same day I did and we loved checking the count every day. When we got under 30 days we never stopped smiling.